Please visit our Menus page for high resolution copies of our take-out, catering and freezer menus. Welcome to Ono Kine Grindz! 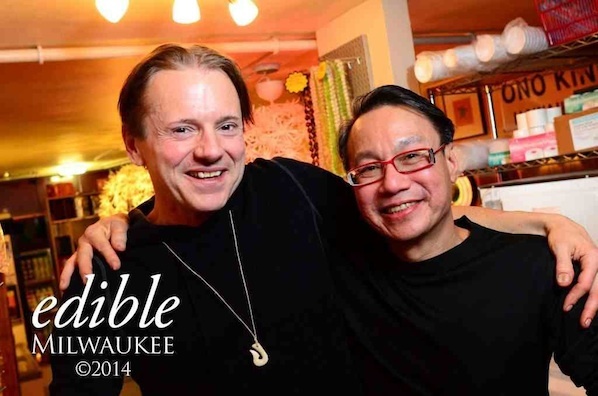 Another new category in this year’s OnMilwaukee Best of Dining poll brings a new winner to the forefront, as the Tosa-based Hawaiian market, deli and caterer Ono Kine Grindz took the prize for Milwaukee’s best takeout. Shop our market and you’ll find an extensive grocery selection. In addition to all of our favorite island foods, we carry unique mercantile and gift items, inspiring cookbooks, authentic art and music, Kona coffees, festive Aloha shirts, and much more… mahalo! 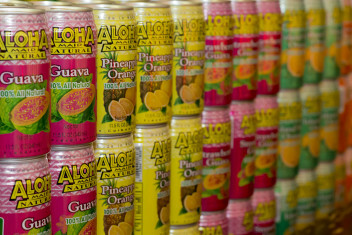 These many flavored nectars are perfect on their own or in a cocktail. Stop in and pick up a six pack, or get yourself a cold can from the cooler. 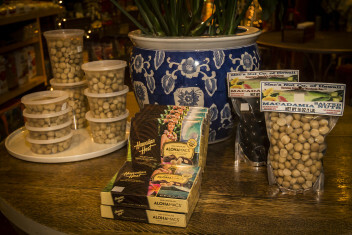 Extensively cultivated and exported from Hawaii since the 1920s, the macadamia nut is a delicious and delightful snack on its own, covered in chocolate, or paired with other fruit flavors. We carry a wide variety. — Sizes range from individual servings up to 1 lb. bags! 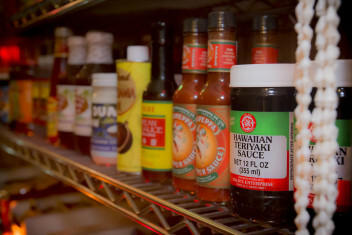 Our market stocks an impressive variety of Hawaiian and Asian imported simmer sauces, condiments, sea salts, rice & more! 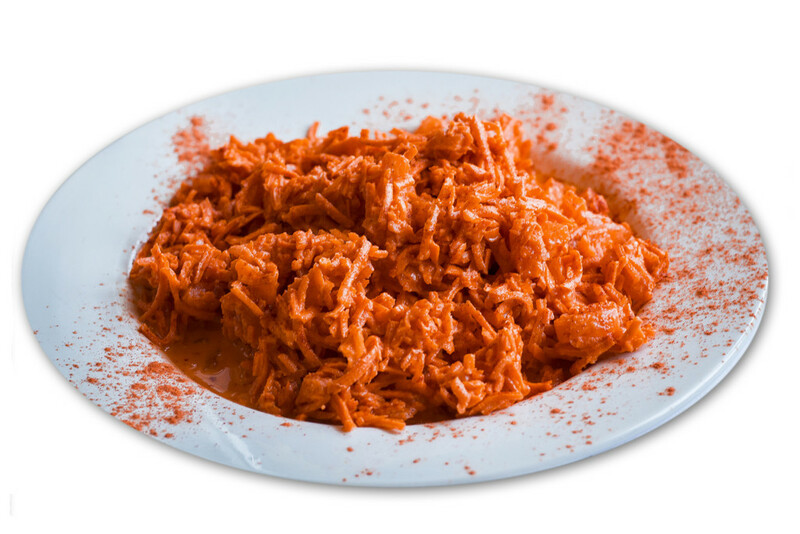 Stop by the shop to add a little sweet and savory, or fruity and fiery zip to your next meal! Our name means “Delicious Specialty Foods”, and inside you’ll find our deli serves a variety of fresh daily offerings, as well as traditional plate lunches for take-out, beverages, and desserts. Check out our menu to learn more. A traditional luau favorite, Kalua pig is smoked and seasoned with Hawaiian sea salt. Not too hungry? 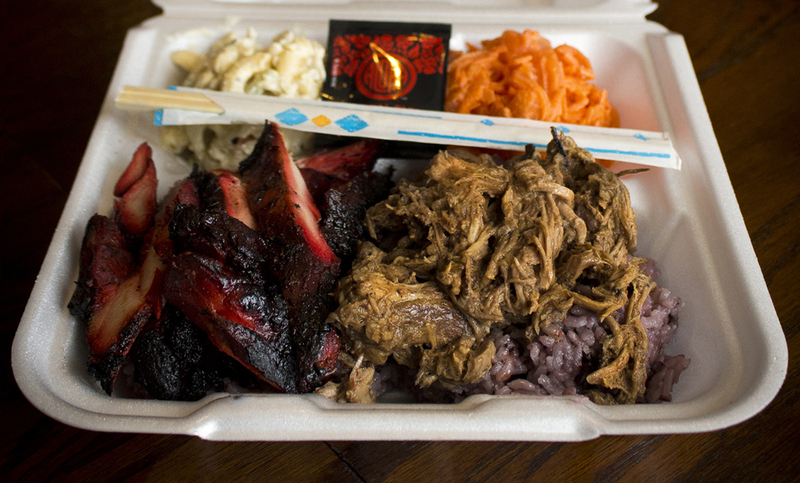 Get a Kalua Pig Bento Box where our delicious pork is served with one scoop of purple sticky rice and a side of your choice. Ravenous? 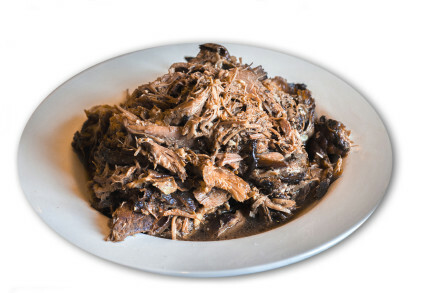 Pick up the Kalua Pig Plate served with two scoops of rice and two sides. 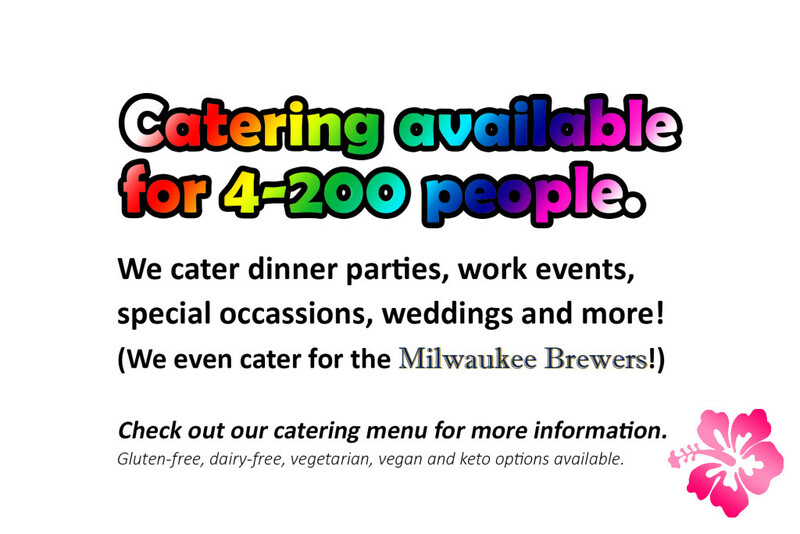 You can also order it on its own to go by the lb., or have us serve it at your next event. This sweet and tangy side combines the pleasant texture and taste of slivered carrots with the acidity and sugary punch of pineapple. Spiced with powdered Li Hing Mui, a Chinese salted dried plum, this creamy/crunchy slaw has become a local favorite. Carol Deptolla says, "Frankly, the food is just too delicious and the place too charming to not take a second, broader look." Connie H. says, "I don't know if I'll be saying anything that hasn't been said but this place is easily a 5! 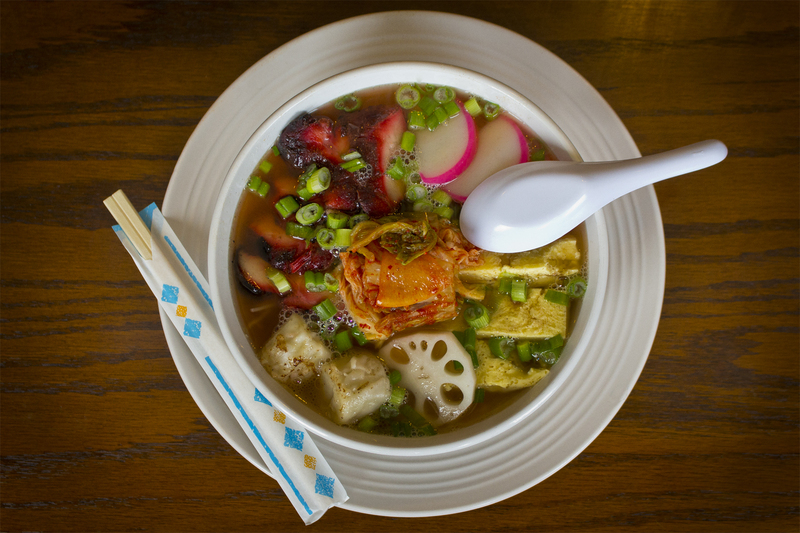 Who would've thought delicious Hawaiian food would be hiding in Milwaukee, WI?" Tyheshia S. says, "Five more stars because Yelp doesn't have a 10 Star option!!! This to me has the best atmosphere, ambiance, and you can not help but feel like family after you meet the Owners and their Staff, or I should say Ohana!! Because that is what it is, one big family sharing their love with you thru the awesome dishes they have coming from their kitchen. I can't wait to come back, which I will do if I can bring myself to leave now!" Louiegee F. says, "One of the most authentic and genuine places to eat. You want amazing Hawaiian noms with super friendly and heartwarming service, then this is the place to go! Also, if you need anything Hawaiian themed you can shop here as well. A must for anybody who can appreciate great food, islander style." Edible Milwaukee commissioned us to create this edible masterpiece. See what they have to say here. 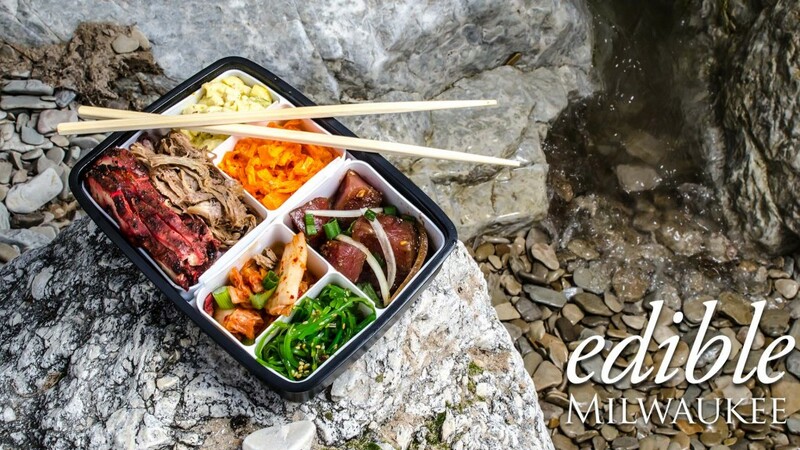 See what our friends over at Edible Milwaukee had to say about the food at Ono Kine Grindz, then watch the 5 minute video where we teach you how to speak Pidgin English and some useful Hawaiian words! Watch at 20:34 to see what our friends at Milwaukee Public Television had to say when John McGivern swung by to visit us. 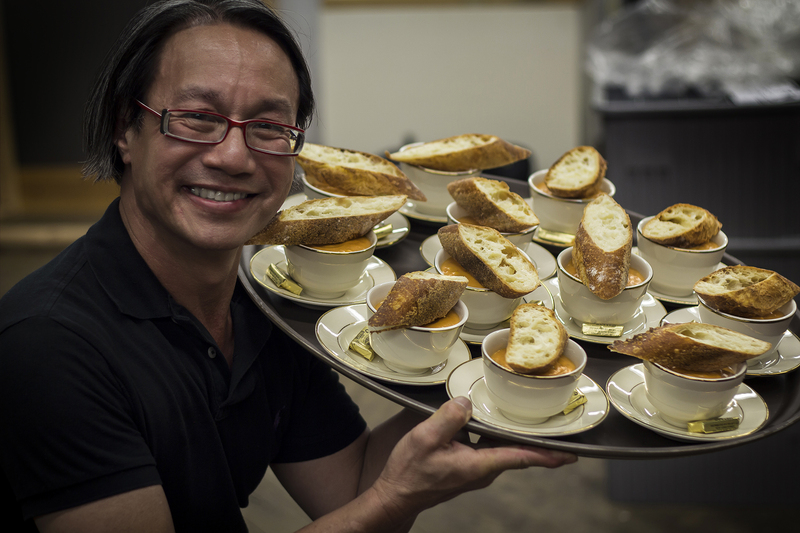 The best way to learn more about us is from those who have dined with us!